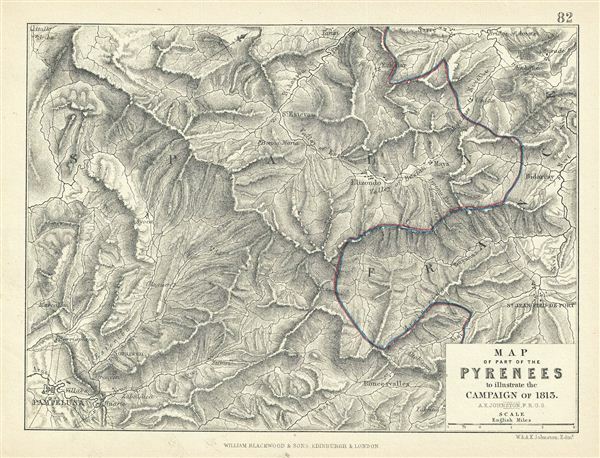 Map of Part of the Pyrenees to illustrate the Campaign of 1813. This is a fine example of Blackwood's 1852 map showing part of the Pyrenees Mountain ranges illustrating the campaign of 1813. The boundary line between France and Spain is hand colored in blue and red. Various important forts and buildings are marked. Various valleys, towns and other topographical details are noted with relief shown in hachure. This map was drawn by A.K. Johnston F.R.G.S and published by William Blackwood and Sons to be issued as plate no. 82 in Atlas to Alison's History of europe.